Since 1960, Harris Environmental Systems has worked with laboratory scientists and production engineers to develop cold rooms that deliver stable environments 24 hours a day, 7 days a week. 3”-thick, insulated panels with .032” white aluminum skins. Temperature deviations at the working height can make compounds unstable and research results unpredictable. Harris cold rooms meet and surpass uniformity requirements of ±0.5ºC and maximum temperature gradients of 1.0ºC. The temperature is constant even when transient heat loads occur from process equipment and door openings. Also, Harris provides an air distribution system that features a perimeter slot diffuser rather than the less-effective “eggcrate” ceiling. High-velocity air from slot diffusers provides even air circulation throughout the space, eliminating thermal stratification. Productive research and manufacturing requires exceptional illumination and a quiet environment. Harris cold rooms are equipped with recessed fluorescent lighting fixtures, which deliver a full 70 to 100 foot candle illumination at the working surface. Air handling systems are designed with components sized to limit noise to an average maximum of 70dBA – the level of normal human conversation. Unlike passive systems, Harris alarm circuits take action to mitigate an out-of-spec condition. For example, if temperature is too low, all cooling is automatically shut down while the system provides visual and audible warning of the problem. Such intelligent alarms ensure that basic corrective measures are taken immediately. Harris rooms meet stringent requirements for FDA CGMP compliance, which means your projects can move to full production with a minimum of process modification. Rooms can also include features for higher volume operations such as power doors, card key access, monitoring connections to central computers and concrete containment curbs for hazardous liquids. Harris cold rooms have flexible mechanical systems, which allow your cold room to be converted to warm-room operations at minimal additional cost. Such features allow valuable planning flexibility and full utilization of your plant investment as products move from laboratory to production. Unlike vendors which provide a limited number of standard-size rooms, Harris insulated panels can be made to fit each installation exactly. This means your limited space will be fully utilized for productive activity. In some cases, particularly where structural columns must be surrounded by the room enclosure, Harris custom-cut panels can increase floor space by more than 15% over rooms built with restrictive, standard size panels. Harris cold rooms are equipped with extra equipment capacity for unusual peaks in cooling and heating loads. Also, all Harris refrigeration systems have safety features such as automatic compressor restarts. Such robust design-features help ensure continuous reliability of Harris mechanical systems. Cold rooms can be designed to maintain virtually any temperature required for life science applications. To ensure the room meets your particular requirements, consider these issues as you develop your specification. In most cold rooms, humidity control is not essential. In those cases, the designer should avoid specifying a defined humidity level in order to minimize equipment costs. There are, however, two reasons end users sometimes include humidity control in the specification: to reduce excessive defrost cycles or to avoid problems with humidity-sensitive products. Cold room refrigeration systems operate at temperatures cold enough to freeze water on heat transfer surfaces. This frost must be melted off when it begins to block air flow. When the system defrosts, the air handler shuts down, and room temperature can rise slightly above setpoint for 5 to 12 minutes. This occurs about four times in 24 hours. A desiccant dehumidifier removes water vapor from the air, allowing the cooling system to run much longer between defrost cycles—days or weeks rather tan hours. When 24-hour temperature uniformity is essential, specifying a desiccant dehumidifier will reduce the frequency of defrost. In other circumstances, sensitive materials demand a uniform humidity. In this case desiccant dehumidifiers create and maintain specified humidity levels. Refrigeration systems are not reliable for close tolerance humidity control at low temperatures, since they must defrost periodically. 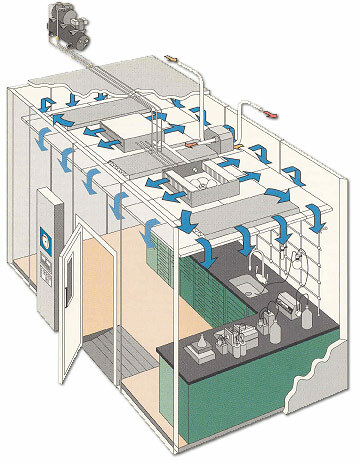 In cold rooms, excess ventilation air leads to high costs. This air carries moisture, which condenses and freezes on cooling coils, leading to frequent defrost cycles. As explained in the previous paragraph, room temperature is slightly out of specification during defrost, so frequent cycles are best avoided. Harris provides 20 cfm ventilation as a standard feature. If ventilation beyond 20 cfm is necessary, it should be clearly specified so additional equipment can e installed to remove the moisture load. For example, if the room goes above the high alarm setpoint, the door heaters, lights, fans, and hot gas valves should be shut off automatically. Active alarms can help prevent “runaway” conditions rather than just announcing that a problem is occurring, and should be clearly specified by the designer in critical applications. To avoid any confusion among suppliers, the room designer should clearly specify PID temperature controls when the uniformity requirement is ±0.5ºC. This will alert the vendor that controls suited only for cold storage rooms are not acceptable. Likewise, if there is no uniformity requirement, the designer should avoid specifying uniformity. Rooms without a uniformity specification, such as storage coolers, are much less costly than environmental rooms. As an option, Harris can adapt the mechanical system to provide Class 100,000 or Class 10,000 clean room conditions in a cold room. This typically requires more airflow, larger air handlers and HEPA filters. Alternately, the designer can specify “HEPA-filtered air” delivered to a particular part of the room to protect a sensitive operation. If the specification already requires close-tolerance temperature control, adding high-quality particle control is not especially costly. The basic structures and construction details needed for clean rooms are already in place with Harris cold rooms. Specifying Class 10,000 conditions adds less than 30% to room costs. Standard surface finishes for cold rooms include baked white enamel on 0.032” aluminum, with anodized aluminum extrusions to join panels. For exceptionally corrosive environments, stainless steel or FRP (fiber-reinforced plastic) panels are available as an option. These options are usually avoided except in extreme cases. Stainless steel presents a visually uncomfortable working environment, and can increase room cost by about 15%. FRP panels add less than 5% to room costs, but must sometimes be checked for compliance with local building codes.